Will “Potphoria on Wall Street” Finally Free American Cannabis? 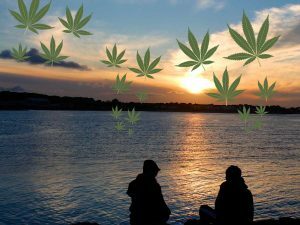 Does Social Media Love or Hate the Cannabis Community? Dank News! This is what’s happening. Some bodybuilders use cannabis as an aid, claiming that marijuana and training provides added force and focus to their lifting routines. RIO DE JANIERO, Brazil - Nicholas Delpopolo is an American judoka who was kept off the 201 Olympic team due to a failed drug test for marijuana. Science is starting to understand what marijuana smokers have known for years: how marijuana helps sleep. Because of this understanding, doctors are now able to legally prescribe marijuana for sleep disorders in seven states. Tetrahydrocannabinol (THC) is the most active marijuana ingredient that affects sleeping patterns. We’ll look into exactly how marijuana aids sleep, delve into how our brains work, and offer insights on this fascinating subject. Parasomnias – nightmares, sleepwalking, talking in your sleep, bed-wetting, teeth-grinding, night terrors, head banging, etc. In one study, researchers used a synthetic cannabinoid. Cannabinoids are the chemical compounds in marijuana that link up with receptors in your brain. Researchers in 2014 used a synthetic cannabinoid much like THC, and found it can help reduce sleep apnea by relaxing a muscle in the chin and tongue. Can THC and CBD help you sleep? Your brain is very active during sleep. When a sleep disorder intrudes, it disrupts your brain’s regular activity. Sleep disorders can be triggered by stress & discomfort, psychiatric issues and psychological problems. Anxiety is one example of a psychological issue that affects sleep. Trauma can cause anxiety, as is the case with PTSD victims. Alcohol and drug abuse can also lead to anxiety – 16.5% of people with anxiety report alcohol or drug abuse. People with anxiety have low levels of the neurotransmitter GABA. GABA regulates stress and helps the brain sleep. Low GABA levels can also cause depression. Depression is one of the causes of primary insomnia. Insomnia is a complex issue. Causes of insomnia can include restless leg syndrome and sleep apnea. Medical conditions such as arthritis and chronic pain can cause it as well. Your lifestyle, including working at home evenings and taking naps, can trigger insomnia. Too much alcohol, caffeine and nicotine can also lead to insomnia. Your brain’s neurotransmitters may be firing or not firing in ways that promote insomnia. Here’s a brief overview: research shows that the THC in marijuana increases deep sleep stages and decreases REM sleep. REM is the stage in which you dream the most. Stages 3 and 4, which come directly before REM, are the deep sleep stages. Deep sleep is when your brain refreshes and restores itself. To understand how marijuana affects sleep, it’s necessary to look at how the endocannabinoid system works. The endocannabinoid system is located in the brain and throughout the body in the central and peripheral nervous systems. The endocannabinoid system helps regulate a variety of functions including appetite, energy & metabolism, stress response, immune function, pain management and sleep. The system produces endocannabinoids which are substances classified as ligands. The ligands bind with cannabinoid receptors. Ligands are like keys that give signals to locks. The locks we know of, the receptors, are called CB1 and CB2. They’re located throughout your body. Based on their interaction with receptors, endocannabinoids either inhibit or excite a reaction from the receptor. They can also set off a cascade of signaling molecules within cells. Our cannabinoid receptors also bind with plant-based phytocannabinoids, such as the THC and CBD in marijuana. As noted above, CBD typically solicits an excitatory reaction from the receptor, while THC tends to have a sedative, inhibitory effect. This study notes the role of endocannabinoid signaling in regulating sleep stability. Researchers administered an inhibitor to CB1 receptors, which increased the stability of deep sleep (NREM). Phytocannabinoids, particularly THC, may also increase the stability of NREM. Marijuana contains both THC and CBD. These cannibinoids affect sleep in different ways. The amount of THC and CBD in marijuana will determine how you sleep and how much marijuana helps sleep. In a study on young adults, researchers determined that THC is a sedative, while CBD has “alerting properties.” When participants took the same amount of THC and CBD together, it actually decreased stage 3 sleep in. THC by itself led to an increase in sleepiness. It did not, however, affect “nocturnal sleep.” This indicates that THC can help you fall asleep, while other studies have indicated that THC increases stage 4 sleep. 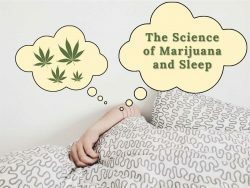 THC in marijuana helps sleep? A study from Frontiers in Psychology showed that THC helps with sleep apnea in animals. THC “stabilizes autonomic output during sleep, reduces spontaneous sleep-disordered breathing, and blocks serotonin-induced exacerbation of sleep apnea.” Since it’s incredibly hard to get permission to conduct the same study on humans, researchers used a synthetic THC called Dronabinol on seventeen adults with sleep apnea. It significantly reduced their apnea in the short-term, helping them breathe easy. What type of Marijuana helps sleep? According to the Colorado Pot Guide, Sativa-dominant strains “tend to be more uplifting, creative and energetic.” Indica-dominant strains, on the other hand, are more “relaxing and analgesic.” Indica strains are what doctors in states such as Colorado and Washington will prescribe for pain and insomnia relief. What are the downsides of using marijuana for sleep? Scientists have found that marijuana abuse blunts the brain’s response to dopamine. Marijuana helps sleep, but the marijuana users in the study were heavy smokers, averaging five joints a day. The dopamine-blunting affect may be one of the reasons that users report no dreams and have a decrease in the REM stage. Although scientists aren’t exactly sure what the REM stage is for, decreasing the amount of REM sleep isn’t natural. Participants in studies have experienced a withdrawal effect when they go off of marijuana where they experience intense dreaming and less stage 4 sleep. There is still a surprising lack of research on marijuana and sleep. Because of this, there is not a lot of conclusive evidence on marijuana’s efficacy for treating sleep disorders. In which states can doctors prescribe marijuana for sleep disorders? Your doctor will tell you what the recommended dosage is as well as method of consumption. Even if you’re in a state where recreational marijuana is legal, be sure to consult a physician for guidance if you are planning on using it for sleep. It may not be right for you. What are other ways to deal with my sleep disorder? It’s not for everyone, but while Marijuana helps sleep, there are also plenty of other ways to promote healthy sleep. Neuroscientists in Switzerland found that the rocking motion of hammocks helped people go to sleep faster and helped them have a deeper sleep. There are natural sleep aids, such as melatonin and valerian. And there are a number of ways to deal with insomnia that involve adjusting your behaviors which can be quite effective. Author: Daniel Matthews is a widely-published freelance writer, social worker, and musician with a passion for the truth, creativity, and understanding. You can find him on Twitter and LinkedIn. Which States Accept My Medical Marijuana Card?